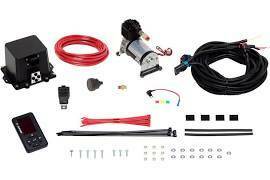 The Firestone Air Command F3 Wireless Air Compressor Kit gives you the ability to adjust your Firestone Ride-Rite Air Bag Helper Springs with just the touch of a button. The Air Command F3 features a wireless controller that gives you the freedom to adjust your air springs to accommodate different loads and road conditions from both the inside and the outside of your vehicle. Firestone?COs Air Command F3 Kit uses technology that is a departure from what has been used in the past, and utilizes industry leading OE grade electronics. The Air Command F3 has the ECU and valve block combined into one easy to install unit, with the air lines and wiring harness plugging into the same side to further ease installation and routing of lines and power supply. The ECU and valve block have been tested to withstand pressurized water, road chemicals, salt spray, immersion, shock and vibration. The one-piece housing unit is also environmentally protected from mud, dust, extreme temperatures, and rust, and can be mounted anywhere.